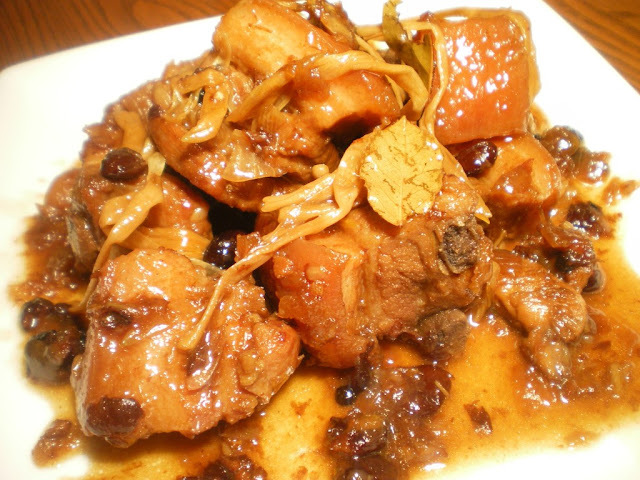 Humba or Umba is the Visayan answer to adobo from the North. A Chinese-influenced dish slowly simmered in a pot to bring out its melt-in-the-mouth texture. Humba recipes vary from household to household but it does seem to be incredibly close to some Chinese treatment for pork, as in pata tim, or slow braised pork with soy and star anise. 1 Mix the Marinade ingredients together in a heavy saucepan, add the pork and marinate for at least 2 hours or overnight. 2 Add the water and bring to a boil. Reduce the heat and simmer until the pork is tender, about 45 minutes to an hour. 3 Add the tahure and peanuts, if using, stir and cook until the sauce thickens, about 5 minutes. Season with salt and serve hot.